eXtreme Movie Manager is software to manage your movie collection. 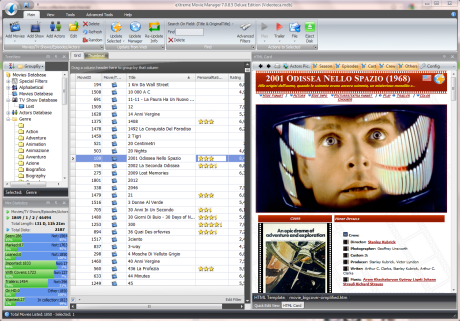 eXtreme Movie Manager is probably the most advanced Movies/TV Series/Actors collection manager around. eXtreme Movie Manager can catalog movies stored in your Hard Disk and removable devices in seconds with all information about codecs, resolutions etc. automatically. XMM import movie information and covers directly from online databases, take a look at supported websites. eXtreme Movie Manager is a powerful software to manage your movie collection. ...... eXtreme Movie Manager will let you catalog any video formats such as DivX, XviD, VHS, DVD, VCD, SVHS, DVD-R, or LaserDisc with detailed information. Quiz Extreme - The powerful, affordable, and easy to use quiz making software. Qweas is providing links to eXtreme Movie Manager 7.2.3.5 as a courtesy, and makes no representations regarding eXtreme Movie Manager or any other applications or any information related thereto. Any questions, complaints or claims regarding this application eXtreme Movie Manager 7.2.3.5 must be directed to the appropriate software vendor. You may click the publisher link of eXtreme Movie Manager on the top of this page to get more details about the vendor.